Commentary: The one bad thing about The Force Awakens being the trooper-iest movie in years is that The Last Jedi is a snooze by comparison. 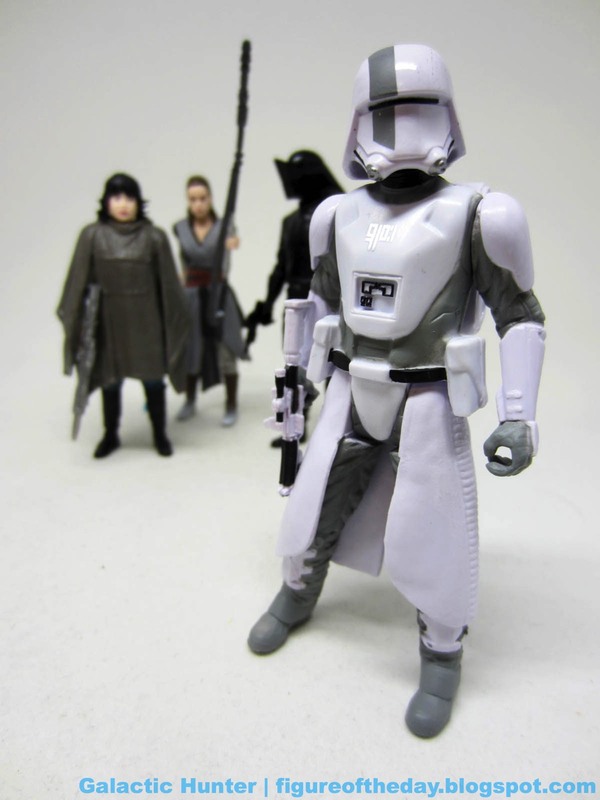 The First Order Walker Driver is a new mold, but it's clearly derived from the First Order Snowtrooper sculpt we got several times since 2015. It's not bad - it's just similar. The 5-jointed figure has a remarkably smooth neck ball joint and decent swivels at the shoulders and hips. He can sit well - which would be great, had Hasbro made that Gorilla Walker from The Last Jedi. The shiny white helmet is great, and the grey looks cool - not unlike the Coruscant Clone Troopers. He's missing a flourish on the left shoulder, and possibly a few other details. The pouches are off to the sides rather than the front of the hips, most likely to allow for easier leg movement. (I approve.) He has no problems standing and looks perfectly fine. I love that it's not identical to a figure I have, but I admit that it's close. I would have loved a wholly new design with a new helmet or new colors - sort of like the AT-AT Driver looked vaguely like a white TIE Fighter pilot - but such is life. Maybe Abrams and friends will dump new troopers galore on us for the next entry. This figure is perfectly good - but not exciting. Hasbro did a good job executing it, it's just kind of a boring design and that's no fault of the big H.
Packaging Notes: This is a good box. The footprint is the same as the previous Disney movie 4-packs, which were designed to be the same size as the digital download boxes a few years ago so a fan could collect them all on a shelf together. This isn't widely promoted. The box itself is much better than the rest of the 3 3/4-inch figure line, with a much better use of the space. The back has bios for all four figures in multiple languages along with shots of figures that show them with (or without) their accessories, and there's no big use of white space like on the Kohl's set. Hasbro did a great job here.